The Law Office of Mona Lyons provides legal advice and services to private and public sector employees. We advocate to resolve workplace conflicts our clients experience, litigate on their behalf, and settle their claims or try them before judge and jury. We regularly and successfully represent our clients in federal and state courts, before administrative agencies, and in arbitrations and mediation. We are committed to providing dedicated and personalized attention to our clients and to fighting steadfastly and fearlessly for their rights. Many of our cases result from referrals by former clients and opposing counsel, and we pride ourselves on achieving the best possible results for our clients while working effectively with our adversaries. 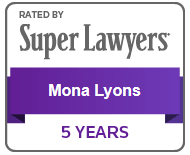 The Law Office of Mona Lyons is located in Washington, D.C. and serves clients in and around the District of Columbia metropolitan area.